There are 35 Assisted Living Facilities in the South Jordan area, with 6 in South Jordan and 29 nearby. The average cost of assisted living in South Jordan is $3,741 per month. This is higher than the national median of $3,346. To help you with your search, browse the 271 reviews below for assisted living facilities in South Jordan. On average, consumers rate assisted living in South Jordan 4.1 out of 5 stars. Better rated regions include West Jordan with an average rating of 4.2 out of 5 stars. Caring.com has helped 12 families in South Jordan find high-quality senior care. To speak with one of our Family Advisors about assisted living options and costs in South Jordan, call (855) 863-8283. Nestled between picturesque mountain peaks, South Jordan, Utah, is a rapidly growing suburb of Salt Lake City. Senior citizens in South Jordan, who make up about 13 percent of the city's population, have a variety of assisted living communities available to them. Utah's Department of Health, Facility Licensing and Certifications, has licensed six assisted living facilities in South Jordan and 37 more in surrounding communities such as Sandy, West Jordan and Draper to provide personal care services for seniors. South Jordan's climate is ideal for seniors who prefer hot, dry summers and winters without much snowfall. According to Sperling's Best Places, South Jordan's "comfort index" is 74 out of 100, meaning that its climate is significantly more comfortable than that of the average U.S. city, which receives a score of only 54. South Jordan's overall cost of living is about 40 percent higher than the national average. High housing prices are the main reason for the cost of living difference. In some categories, seniors can expect to pay less than average. For example, groceries are about nine percent cheaper in South Jordan than the national median cost. Seniors and their families will be happy to learn that South Jordan ranks above average in personal and property safety. On a scale of one to 100, South Jordan's violent crime rate was only 18.2 compared to a national average of 31.1. The property crime rate was 29.5 compared to the U.S. median of 38.1. The South Jordan area offers plentiful opportunities for senior outings and day trips, including visits to the Megaplex Theaters and the Loveland Living Planet Aquarium. Outdoor enthusiasts can also take advantage of the many parks that dot the city's landscape. The Utah Transit Authority offers convenient public transportation by bus. Seniors aged 65 and older can usually ride at reduced rates. Free transportation to the South Jordan Community Center can also be reserved by calling 801-302-1222. The South Jordan area is home to world-class medical facilities, including the South Jordan Health Center, in the event of medical emergencies or illness. Assisted Living costs in South Jordan start around $3,741 per month on average, while the nationwide average cost of assisted living is $4,000 per month, according to the latest figures from Genworth’s Cost of Care Survey. It’s important to note that assisted living rates in South Jordan and the surrounding suburbs can vary widely based on factors such as location, the level of care needed, apartment size and the types of amenities offered at each community. 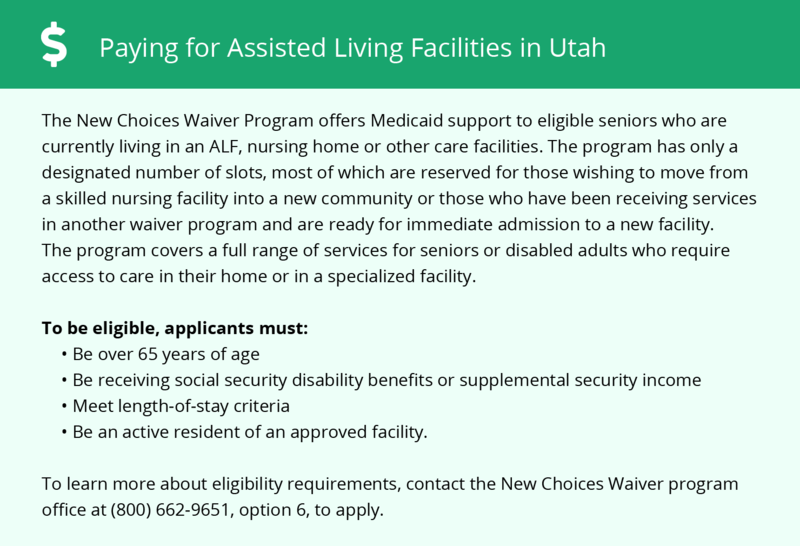 Unlike many states, Utah does not offer a Supplemental Security Income (SSI) payment for assisted living facilities. 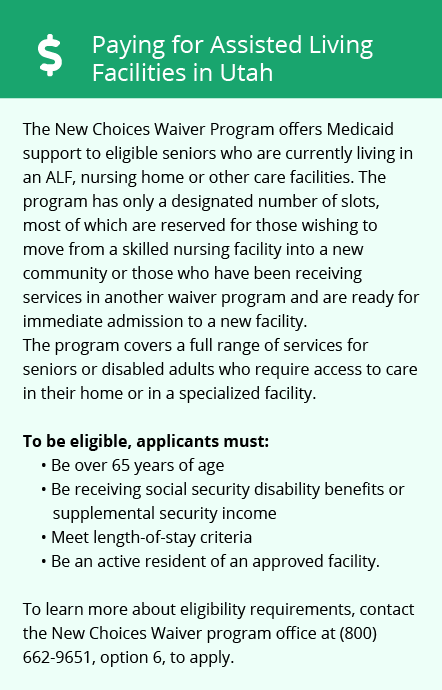 However, qualifying seniors can still get help paying for assisted living in South Jordan through Utah's Medicaid New Choices 1915(c) Waiver program. South Jordan and the surrounding area are home to numerous government agencies and non-profit organizations offering help for seniors searching for or currently residing in an assisted living community. These organizations can also provide assistance in a number of other eldercare services such as geriatric care management, elder law advice, estate planning, finding home care and health and wellness programs. To see a list of free assisted living resources in South Jordan, please visit our Assisted Living in Utah page. South Jordan-area assisted living communities must adhere to the comprehensive set of state laws and regulations that all assisted living communities in Utah are required to follow. Visit our Assisted Living in Utah page for more information about these laws.